Here’s a sneak peak of what Suicide Cliff is all about! 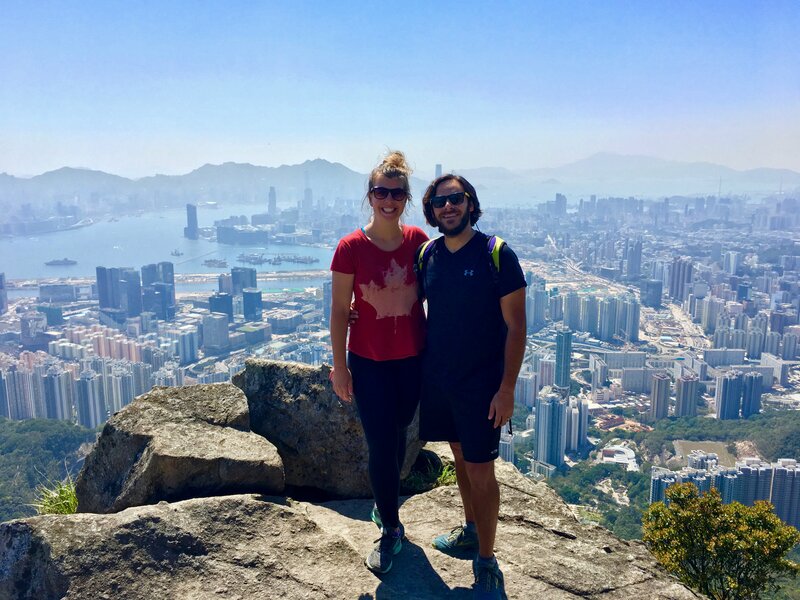 If you’d like us to guide on this SPECTACULAR hike, just click below, and we’ll start planning with you! To top this, on my way home after the hike, I realized that the particular approach trail we took was equally if not more stunning than Suicide Cliff itself! The approach trail we took afforded us one of the best 360-degree views of Hong Kong I’ve ever experienced in my nearly 5 years of hiking ALL over this marvelous city. The view point I’m referring to allowed us to see Tai Mo Shan, Pat Sin Leng, Ma On Shan, Marina Cove, Victoria Harbor, Kowloon, Hong Kong Island, Victoria Peak, High West, Mt. 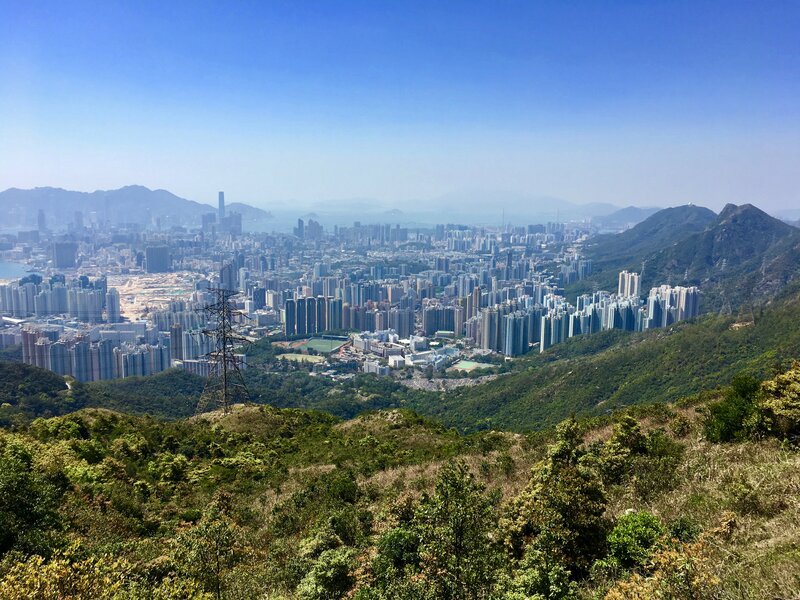 Davis, Lantau Island, Tuen Mun and Shenzhen. Quite a list, I know. Below, I’ll share with you all the details you’ll need to experience Suicide Ciff yourself. I’ll also let you know the specific approach trail to take (there are many options) so that you too can have your mind blown by being able to see the incredible 360-degree I keep mentioning. 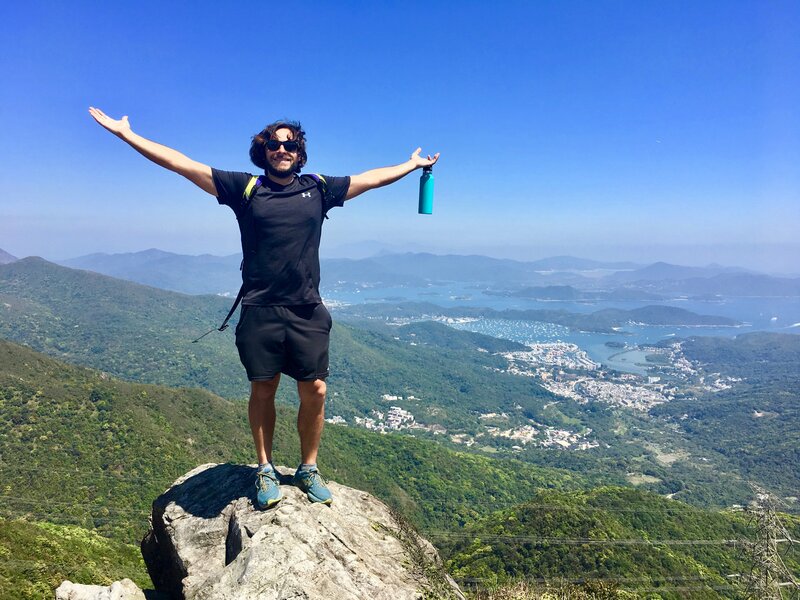 By the end of this hike, and in spite of having hiked all over Hong Kong for the past 5 years, my partner Julia and I agreed that we had just discovered one of our new favorite hiking routes here in Hong Kong. We think you’ll feel the same way after you experience it all for yourself. For a day hike, we usually pack quite light. Because there is always a chance of rain and/or a cold windy part of the trail, we bring our raincoats. Julia uses this Marmot raincoat*, and I use this Marmot raincoat (it’s the same as Julia’s, just cut for men). We of course always bring water too. For this hike, we each brought 2 litres. These Hydro Flask water bottles are rugged, reusable and best of all, insulated. On hot days we fill them with ice water, and on cold days we fill them with warm water. We also feel morally good using them because we know how important it is to always be living greener here in Hong Kong. 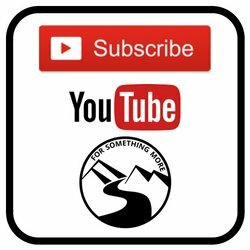 This next item is one of our favorite pieces of hiking/travel gear, and it’s a super simple, super lightweight, super effective, and super affordable in-line water filter by Sawyer. This filter allows us to drink water from any cool and refreshing wild water source without having to worry about getting sick. On this hike, I found a seasonal spring (I’ll tell you where it is, below), and I would not recommend drinking from it without using a filter. If we’re relying on our phones for navigation, we’ll also bring a power bank for our phone. Last but certainly not least, on any day hikes much longer than 10km we both bring our hiking poles. We most often use them on the downhills, and everytime we do, our knees thank us profusely. 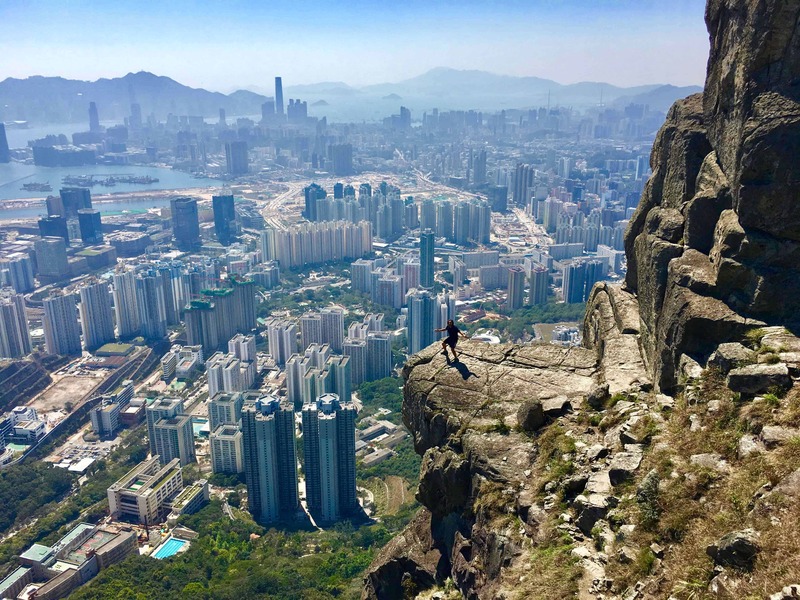 There are many ways to hike Suicide Cliff. The information below is for our route, the one that includes the beautiful 360-degree view that we’ve been ranting and raving about as well as, of course, Suicide Cliff. As you can see from the elevation profile above, the hike is a starts out quite flat and then transitions into a gentle uphill for most of the time. While it looks a bit challenging, it’s really suitable for beginner/intermediate hikers. While we were out on this route, we saw a number of families with young children, so don’t be intimidated by the elevation profile. It’s a lot easier than it looks. 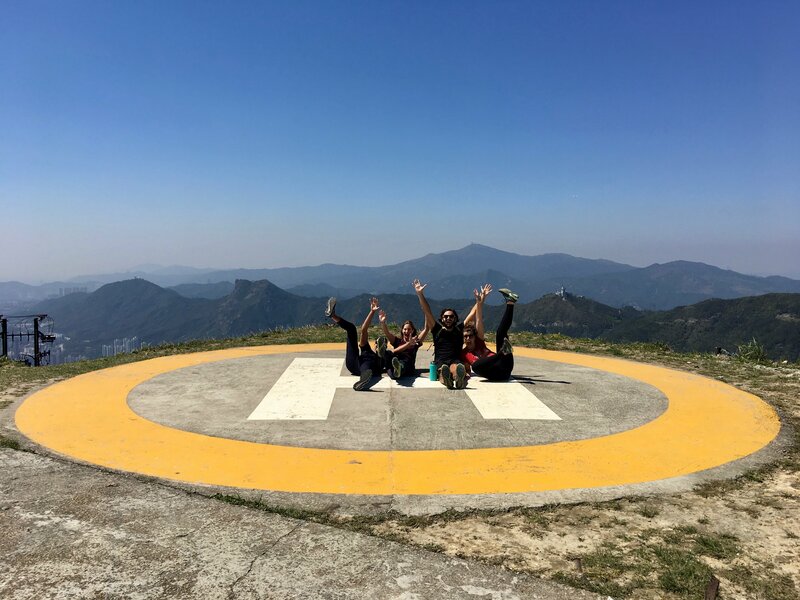 If however you’d like us go guide you on this hike, click below, and we’d be glad to arrange private or group hikes to your liking! 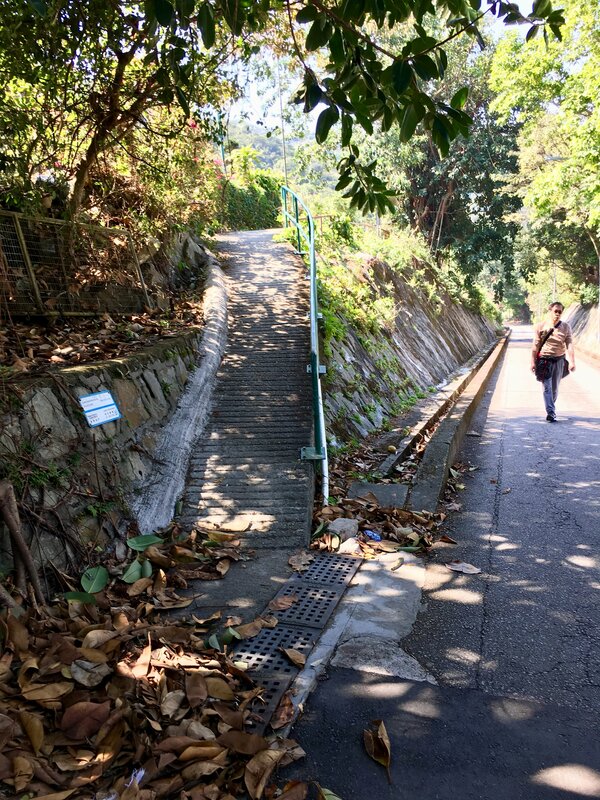 It’s possible to hike Suicide Cliff from the Choi Hung MTR Station. This route is quite short and goes directly to the cliff. However, this route does not include the approach trail with the spectacular 360-degree view. In order to hike Suicide Cliff and see the 360-degree view on the approach trail, simply follow along on our Suicide Cliff route map, also displayed below. When you’re out on the trail, just click on the link above to display our route in your Google Maps app. (If you don’t have Google Maps, download Google Maps for iOS here and Android here.) Then, follow along on the map as you’re hiking, and you’ll not lose your way! Just don’t forget to look around and enjoy the scenery, even while you’re navigating! MAP NOTE: Once our Suicide Cliff route map has popped up in your Google Maps app, don’t forget to click on “View Map Legend” at the bottom of the map to see (1) the location of the natural spring and (2) the location of the 360-degree view. On the map below, you can click on the arrow-symbol in the top left hand corner to see the map legend. 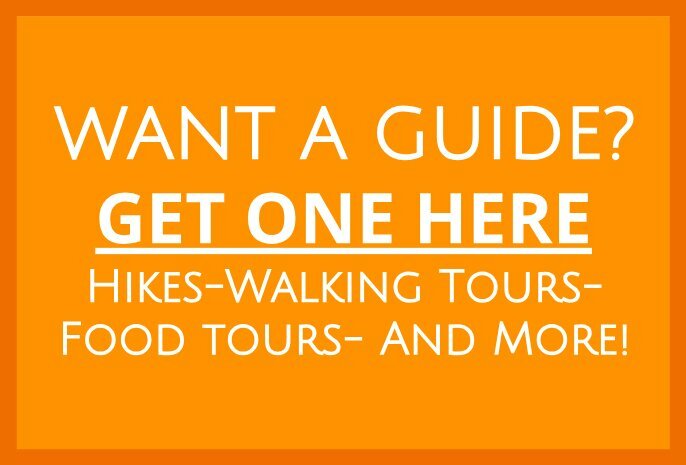 Again, if you’d like a guide for this hike, click below, and let us know! We’ll get in touch with you soon thereafter to start making arrangements! As I mentioned above, you should NOT drink from any natural sources of water unless you filter it with something like this in-line water filter by Sawyer. 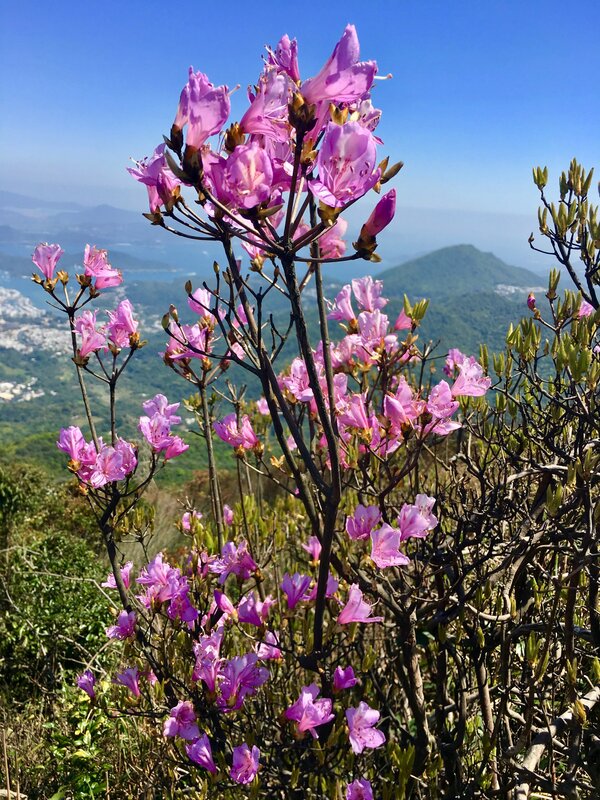 Seasonal Spring – You can also find the location of this spring on our Suicide Cliff route map by clicking on “View Map Legend” at the bottom of the map. 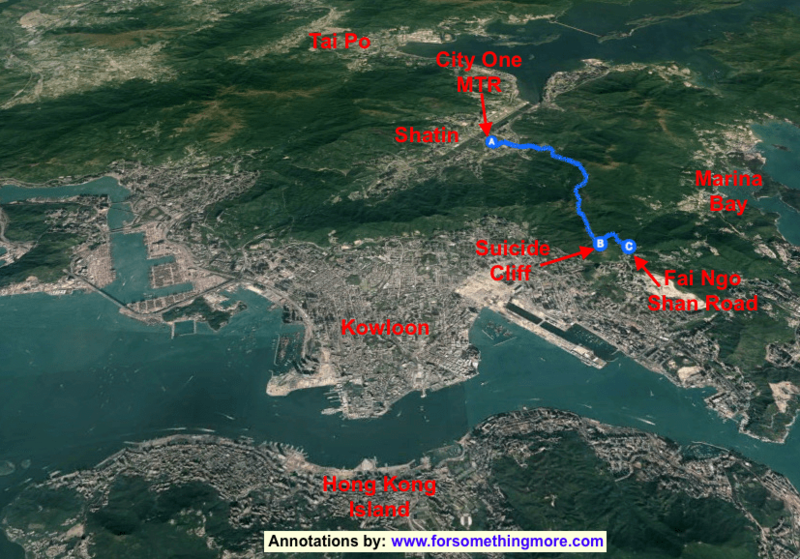 Take the MTR to City One MTR station, exit D, then use our Suicide Cliff route map, and you’ll be well on your way. If you’re not familiar with Hong Kong, here is an MTR system map. We’re not going to spoil all of the spectacular views you’ll see along the way, so here are just a few, to wet your appetite! This hike is rewarding yet family friendly, so all you have left to do at this point is lace up your hiking shoes, and get hiking! 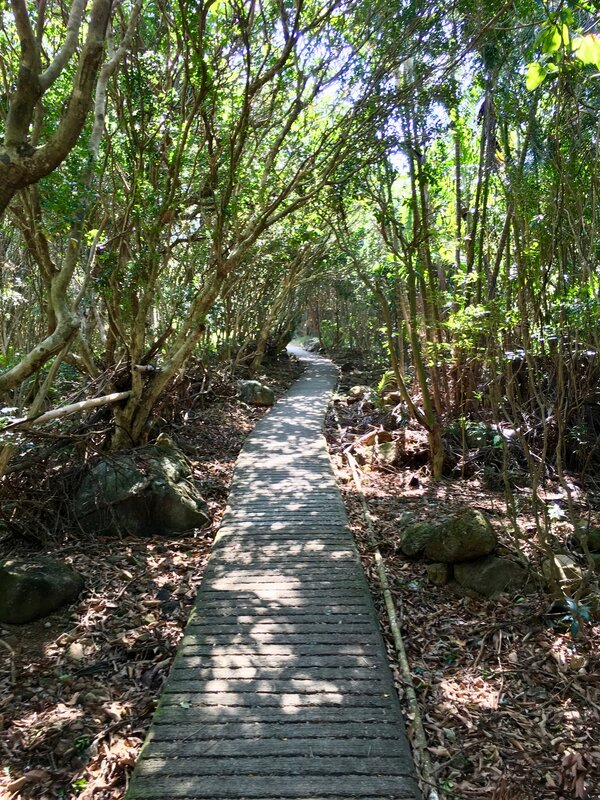 If you’re looking for other off the beaten path Hong Kong adventures consider taking a hike to this remote beach on Lamma Island or hiking the eight peaks of Pat Sin Leng. 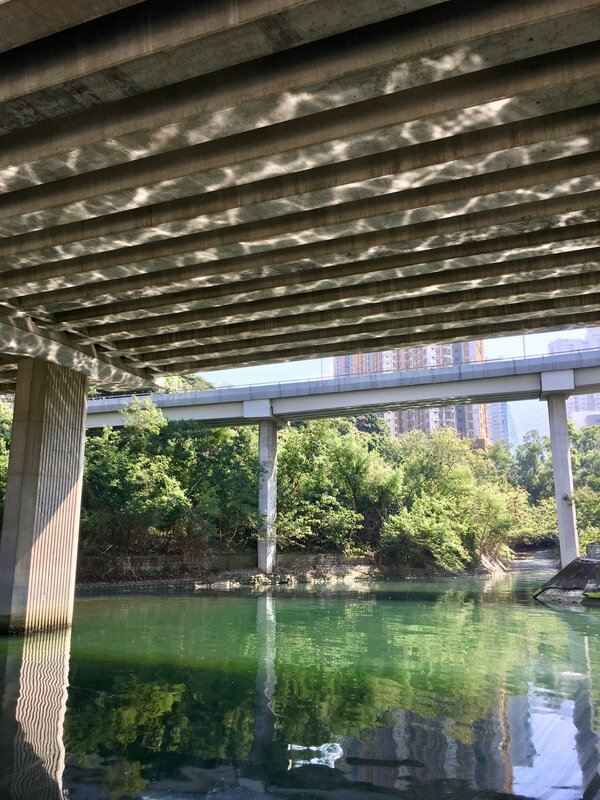 If you’re looking for something a little more mellow, how about you try an urban hike from Kennedy Town to Central? Why not stop at Instagram Pier along the way? And as always, if you have any questions about any of this, leave them in the comment section below, and we’ll get back to you just as soon as we can. The call of the void is too strong for me. I have to stand several feet behind the yellow line when I wait for the train. No standing alone on balconies. No looking down at lower lobbies. Looks beautiful, but no wait am I getting near this cliff. I definitely had to muster up all of my courage to get so close to the edge! 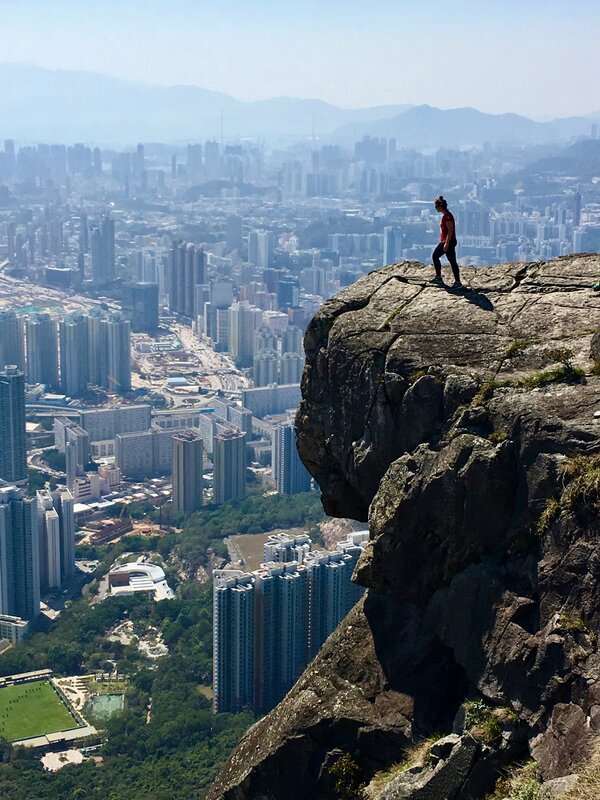 Indeed, if you are scared or uncomfortable with heights, you might not want to go right to the edge. However, you can still enjoy Suicide Cliff! Just don’t go all the way out to the edge. It is a nice route with great views. We followed the google map route. The first part was quite difficult, There is hardly a trail there. 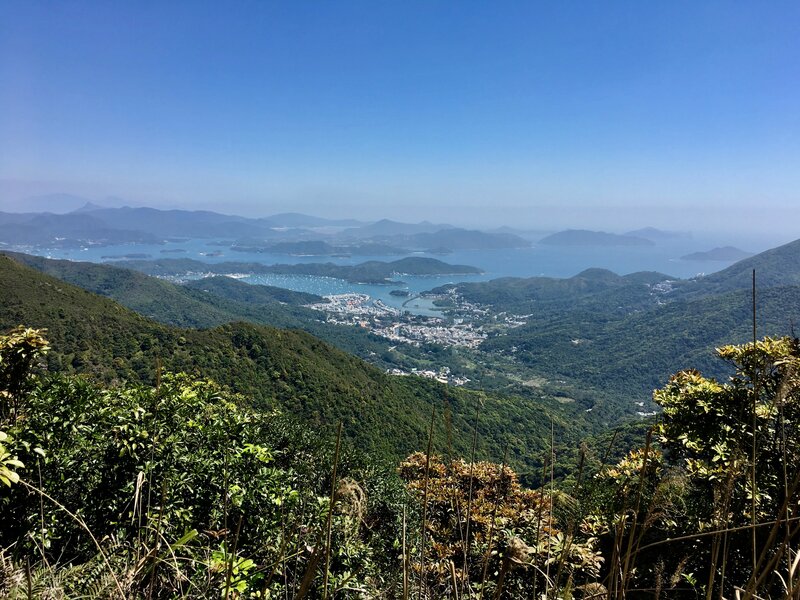 Once you reach the maclehose trail it gets much easier to walk and follow the route and enjoy the views. This looks awesome! We’ll definitely want to try this out next time we’re in Hong Kong. It’s so easy to forget there’s so much to explore everywhere you go. Beautiful photos! easy to forget some of them! 🙂 When you’re back, let us know. Maybe we can hike it together! Hi, this looks amazing! How long did the whole route take you? Thanks for the question 🙂 The route we have listed will take ~3 hours, if you go at relaxed pace. It could take a bit more or less if you’re going faster or slower of course! Let us know is you have any more questions! 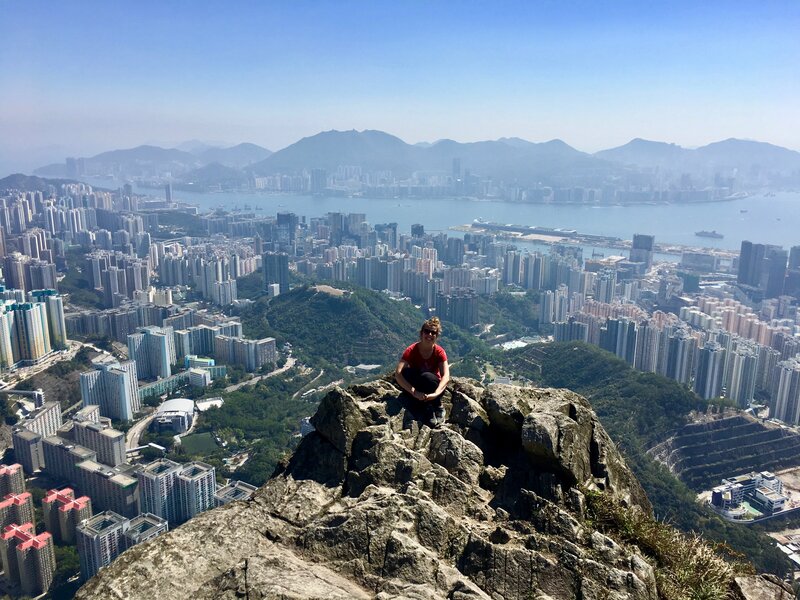 I’m getting dizzy just looking at these photos, but the views are so incredible! They are a bit dizzying! Looks amazing! Planning to hike it up in July but I’m a bit hesitant because I’m going alone. Any chance you know a guide or someone who can show me the way? There’s no map in the world helpful for someone who doesnt have a sense of direction (ME). Please help! Thank you! Thanks for writing such detailed description; always so happy that there’s people taking the time to do this, thanks!! 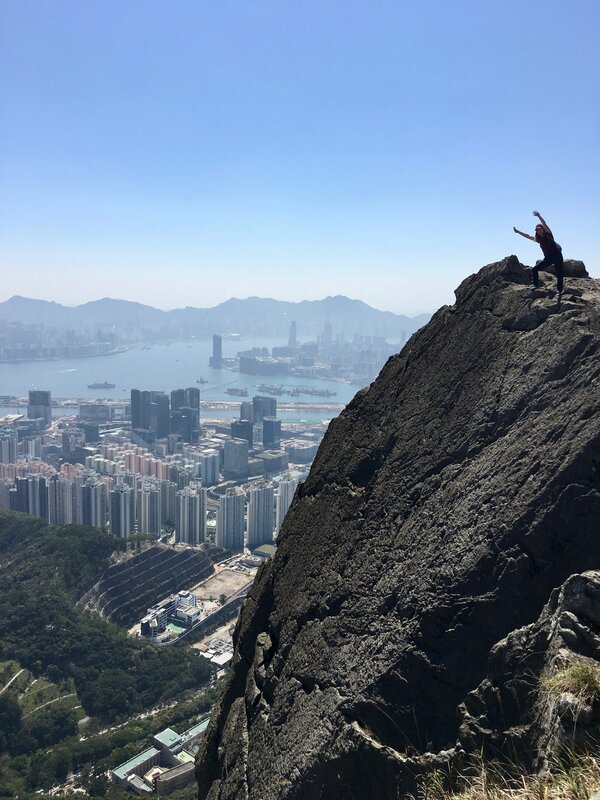 Tried the hike today, also after being 5 years in Hong Kong. Beautiful one! We followed your path yesterday but found it very difficult compared to what you were saying. The first 2 hours are quite useless from MTR to Kowloon peak) no views, only steps so we didn’t enjoy it. 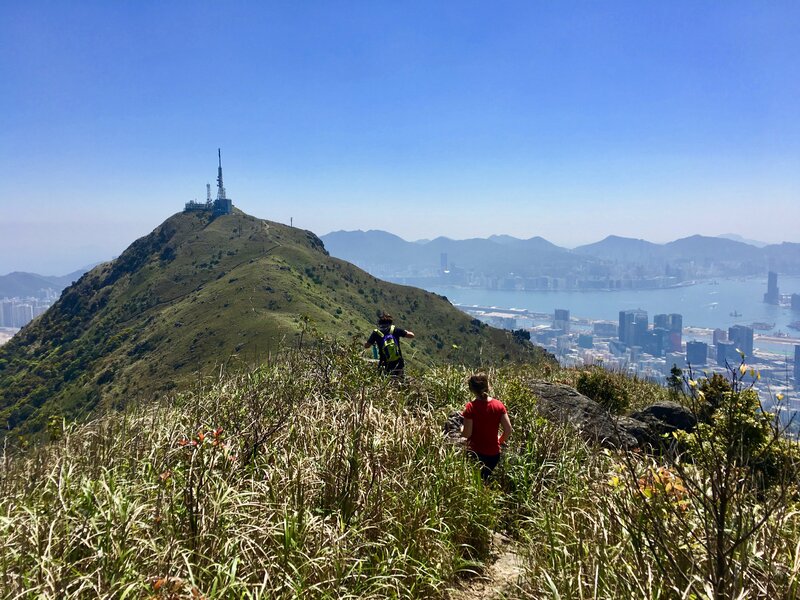 Second part from kowloon peak to suicide cliff is amazing but challenging, I will not bring children (some signs forbid to take this path!). Thank you for your advice anyway we enjoyed the views ! I’m sorry to hear you did not enjoy the first section of the trail. I guess the definition of “beautiful” is in the eye of the beholder 🙂 I’m also sorry to hear it was difficult. Again, this is certainly all relative. I’m glad you enjoyed Suicide Cliff! We love it too! Please let us know if you have any more questions or comments, as we are glad to help! Hi I have been “dying” to do this, how long did it take you, what time did you start and what time did you finish? The route with the approach trail is ~10km, and it takes us, at a moderate pace, about 3-4 hours. The route without the approach trail, again at a moderate pace, takes us about 1-2 hours. Hi, may i know how long it takes to hike to the 360 degree view spot? We would like to catch the sunset. Thank you! From City One MTR it’s ~7km. At a slow pace, this could approximately take 3 hours, medium pace 2.5 and fast 2. 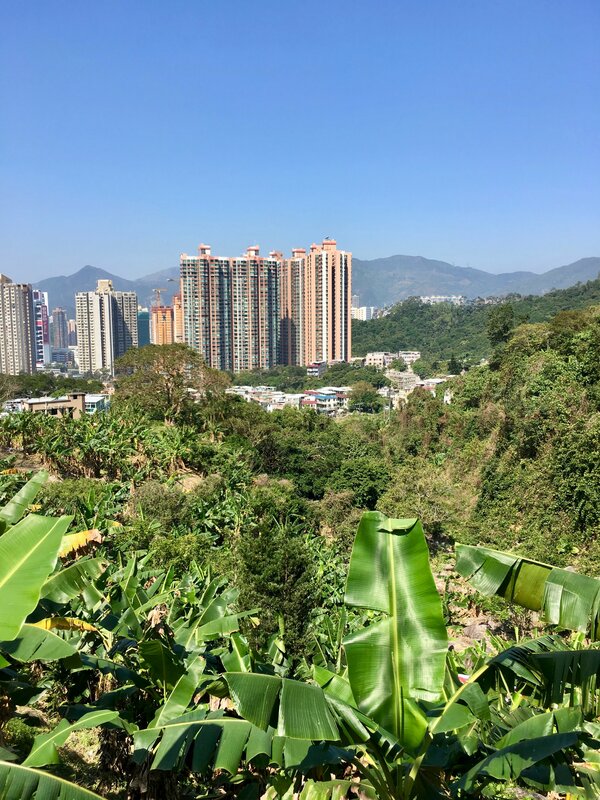 From Fai Ngo Shan Road it’s ~3.5km. At a slow pace this could approximately take 2 hours, medium 1.5 and fast 1. I hope that helps! And if you need a guide, we are glad to help!